And then there are the earthquakes, tsunamis, tornadoes, prairie fires, volcanic eruptions, floods, oil spills, and mine cave-ins: Haiti, Chile, Japan, Indonesia, Australia, Texas, Missouri, North Carolina, Gulf of Mexico, and more. Earth is waking up, too, and letting it be known that she is not amused. 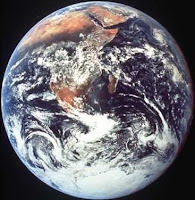 The image that keeps coming to my mind is that of Earth as seen from space in that famous portrait taken almost 40 years ago by the Apollo 17 astronauts. The focus of this photo is Africa, the birthplace of Earth’s most precocious progeny to date, the human, who descended from their hominid forebears over two million years ago. 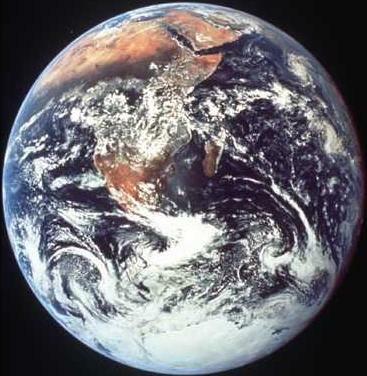 Scientists estimate that Earth, on the order of 4.5 billion years old, is about midway through her own life. Putting those 4.5 billion years on the scale of a 45-year-old, mid-life human, it’s been about 8 days since our genus homo first appeared. In that week and a day of life, we, the infant human species, have multiplied ourselves to nearly seven billion individuals, dominated Earth, drained her of energy and resources, and committed fratricide against our own and sibling species. At the top edge of that same portrait, a corner of Earth appears that we humans have come to call the Middle East, cradle of Western Civilization and three of its great religions. It is a region where, over the centuries, we have been particularly adept at exploiting Earth’s resources, presumptuously staking private claim to the gifts that Earth has given us all to share. We have also in this region (as elsewhere) been particularly intent on oppressing and killing our brothers and sisters. The picture is most notable, though, for what are not there – lines in the sand! But we humans insist on drawing lines to demarcate territory and property. Imaginary lines in the sand – is that what we are fighting and killing over? We imagined lines into existence; certainly we can imagine them away. Perhaps this place where East meets West and the West was born can be the place where we humans boldly pass into adulthood, as we must if we are to survive as a species. It is time to leave our infancy. It is time to leave the make-believe behind – everything from private ownership of Earth to the nation state (which, in the eight-day time scale of homo on Earth, we invented less than 20 seconds ago). It is time to grow up and know that we are one humanity and an integral part of one Earth, and to take our responsible place in it. Your blog promises to be very interesting and informative! It takes several generations for ''Change'' to take place. Have faith, it has only been 40 years since that new view has been posted, I think it fair to say half of the world have yet to see it, none the less change is taking place. I have just read the below from an article by Nancy Seifer and Martin Vieweg (full article at http://whenthesoulawakens.org/whats-going-on_403.html). The whole article is so much in line with your blog. Thank you for sharing the wonderful story of the Green Pen. I felt I was really there walking with you outside on the Path looking down on the village where the baby cried. That represented for me the beginning of the new era in which the time would come and be right for the Green Pen to begin to write.